Dr. Greg Robinson will discuss his book “After Camp: Portraits in Midcentury Japanese American Life and Politics” on Saturday, March 2, at 2 p.m. at the Japanese American National Museum, 100 N. Central Ave. in Little Tokyo. “After Camp” illuminates various aspects of a central but unexplored area of American history: the midcentury Japanese American experience. 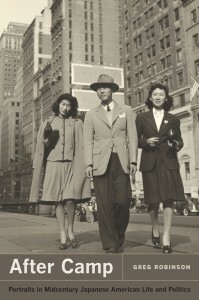 A vast and ever-growing literature exists, first on the entry and settlement of Japanese immigrants in the U.S. at the turn of the 20th century, then on the experience of the immigrants and their American-born children during World War II. Yet the essential question — “What happened afterwards?” — remains all but unanswered in historical literature. Excluded from the wartime economic boom and scarred psychologically by their wartime ordeal, the former camp inmates struggled to remake their lives in the years that followed. This volume consists of a series of case studies that shed light on essential postwar various developments such as resettlement nationwide, the question of assimilation, and the relations between Japanese Americans and other minority groups, including Mexican Americans, Jewish Americans and African Americans. “After Camp” is available for purchase at the Museum Store. Robinson’s other books include “Pacific Citizens: Larry and Guyo Tajiri and Japanese American Journalism in the World War II Era”; “A Tragedy of Democracy: Japanese Confinement in North America”; “By Order of the President: FDR and the Internment of Japanese Americans”; and “Mine Okubo: Following her Own Road.” He writes a column, “The Great Unknown and the Unknown Great,” for Nichi Bei Weekly in San Francisco. A native New Yorker, Robinson is a professor of history at l’Université du Québec À Montréal, a French-language institution in Montreal, Canada, and a researcher at that university’s Center for United States Studies and Chaire de Recherche sur Immigration, Ethnicité et Citoyenneté. A specialist in North American ethnic studies and U.S. political history, he teaches courses on African American history, 20th-century U.S. foreign policy, American immigration history, and visible minorities/racial groups, among others. He received his M.A. and Ph.D. in American history from New York University, and a B.A. in history and French civilization from the University of Pennsylvania.